The measurable, prescription cannabis tablet. Idrasil® will harness the medicinal analgesic and therapeutic benefits while effectively removing the negative connotations and social stigmas. Idrasil® is an effective, non-addictive, non-opioid pain management option specifically targeted toward valid patient ailments. Conveniently available in a pill, Idrasil® will improve the Quality of Life for patients and their families. Idrasil® minimizes the adverse effects of opiate based treatment such as addiction, depression, lack of appetite, incoherence and constipation. With Idrasil™, patients are alert, lucid, happy and enjoy more quality time with their families. Idrasil® is the first standardized form of medical cannabis. Idrasil® has a consistent formula that allows physicians and caregivers the ability to provide patients with a measurable dosage. THE ONLY “All Natural” Medical Cannabis Rx recognized and paid for by most health insurance providers in California. With Idrasil®, patients are alert, lucid, happy and enjoy more quality time with their families. We at Idrasil® are Committed to the Highest Standards of Scientific Technology and Research Innovation. Idrasil® provides all of the medicinal analgesic & therapeutic benefits of Medical Cannabis without the social risks associated with smoking or the unpredictable dosages of edible confections. Idrasil® eliminates the negative social stigmas associated with Medical Marijuana and replaces them with a mainstream ALL NATURAL NUTRACEUTICAL which looks like any other pill on the market. Cannabinoids are the active components of Cannabis. Tetrahydrocannabinol (THC) & Cannabidiol (CBD) are the most prevalent natural cannabinoids and have received the most study, however, Idrasil® contains over 65 cannabinoids. 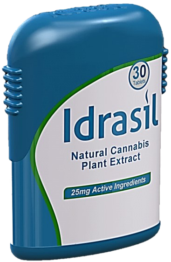 Unlike Marinol (Dronabinol), which are synthetic forms of a single cannabinoid (THC) only, Idrasil® is an all-natural cannabis plant extract containing the full spectrum of naturally occurring cannabinoids (cannabis). Our proprietary technology effectively isolates all of the cannabinoids from the cloned cannabis plant resulting in a PURE NATURAL EXTRACTION. Idrasil® minimizes the adverse effects of opiate-based treatment such as addiction, depression, lack of appetite, incoherence, and constipation. 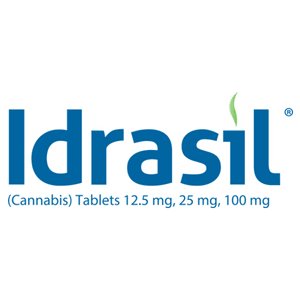 Idrasil® is manufactured in a sterile laboratory with a standardized and consistent, 12.5mg, 25mg, or 100mg dose pill. Idrasil® provides all of the medicinal benefits of Cannabis without the risks of smoking or the unpredictable dosages of edible confections. Idrasil® is the first non-smoking form of all natural, medical cannabis. No social stigmas. Are you currently taking Prescription Drugs? Idrasil® may be able to replace your current medication to give you all natural relief. See if Idrasil® can replace your RX Today! In order to purchase Idrasil®, C3® International, Inc., you MUST have a prescription from a Doctor. Simply talk to your doctor about Idrasil® today. Follow the steps below to get started. Idrasil® allows physicians and caregivers to provide a STANDARDIZED & CONSISTENT FORMULA with a MEASURABLE DOSAGE (12.5mg, 25mg, 100mg Pill), each and every time to their patients.